These products are suit for NISSAN TIDDA, we have Front Tower Bar, Rear Tower Bar, Front Lower Chassis X brace, Rear Chassis Structural Bar, Middle Structural Bar(Two items), etc. 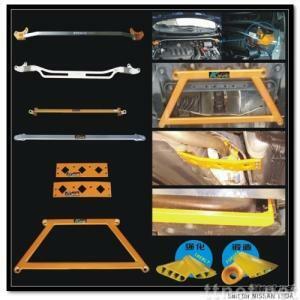 Different years of Cars maybe need matching different Strut bar,please feel free to contact us for more information. Product Features: 1.Bar Material: Aluminum Alloyed(6063), three accessorial bar inside the strut bar,good mechanical property with light weight. 2.Bottom Material: Steel plate, fillet processing ,stamping to shape. 3.Bar Body: forging to shape. Good mechanical property. 4.Connect with special screw, good mechanical property with good-looking shape. 5.High luminance and polishing Finishing. We are leading the way in Polishing technique line. 6.Precise jointing, good-looking and durable.